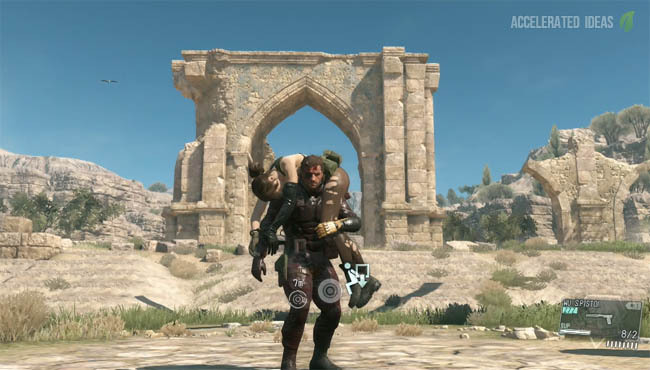 Capturing the brown bear is one of the Side Ops that takes place in Afghanistan at the beginning of the game. In this walkthrough I'll show you the map location of the bear and how to catch him. 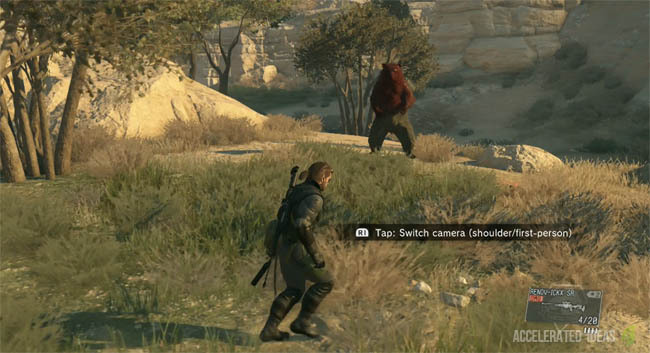 In MGS 5 players have the option to capture any of the animals out in the wild. This includes everything from rats, hedgehogs, birds and of course bears! The larger the animal the more difficult it is to catch and in the case of the bear its one of the largest animals in the game. Finding the brown bear is half the effort in this Side Op but don't worry I'll explain exactly where he is for you. First up, choose the deployment landing zone to the north of the bears predicted area. I suggest you choose a mobile buddy such as D-Horse or D-Walker for this mission so you can navigate the terrain quickly. Head West of the landing zone and approach the gap between the mountains. Follow the path round and south, climbing over rocks until you reach an enclosed area. This is where the bear lives and he'll be walking around, probably eating when you arrive. 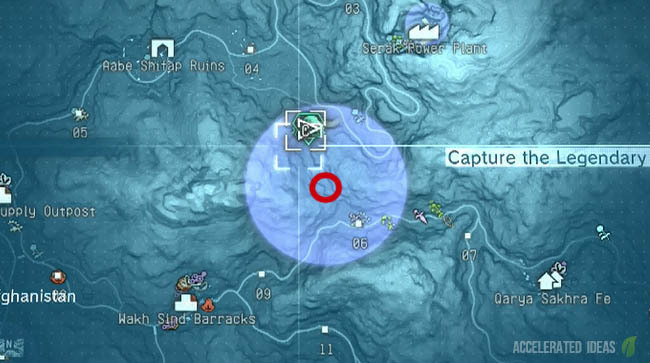 I have highlighted this area on the image above using a red circle. Note: I don't think it's possible to reach this area from the southern landing zone because the cliff edge is too steep for climbing. 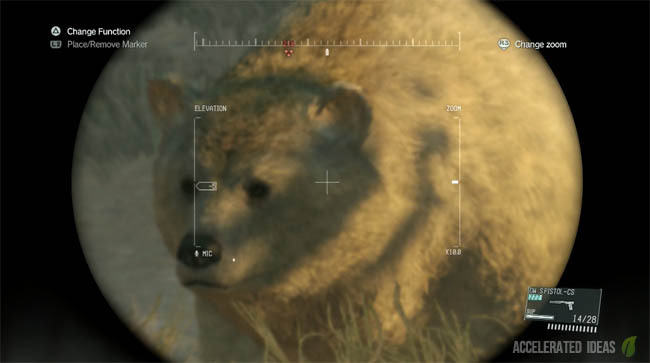 The aim of this mission is to capture the bear, not to kill it. 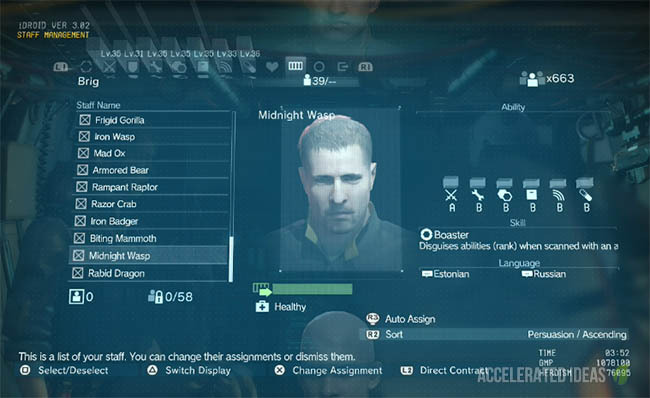 Therefore choose a Loadout that includes non-lethal weapons so you can put the bear to sleep rather than kill it. Once you've spotted the bear it's worth marking him so you know how close he is to you. Then approach carefully and keep note of an escape route. The bear will not leave this area so running away is an option if he tries to charge you. One single hit by the bear is enough to either kill you or require medical attention, at which point the bear strikes you again and you die anyway. The key to capturing him is to hit him with enough tranq darts to knock him out. Then you need a powerful Fulton to get him back to base. On my first try I took the basic tranquilizer pistol which had very little effect on the bear, even after unleashing all the ammo he was still standing. I also had the small Capture Cage but the thing was tiny, presumably intended for a mouse or rodent, and certainly not large enough for a bear. Then I tried the Riot SMG which is an automatic non-lethal weapon. It comes with more ammo and of course a better fire rate. Again this weapon had little effect on the bear and I'm sure I caught him laughing at this point. Having spent an hour or so on this Side Ops I decided to go away and come back later with better equipment. This time I came back with the tranquilizer sniper rifle as the primary weapon. This beast of a weapon strikes fear into thing - bears included. Just as a precaution I also took Quiet and placed her high up at an appropriate sniper point. It took a single dart from my sniper and the bear was knocked out instantly. By this point in the game, I had unlocked the Fulton upgrade that supports lifting out animals and vehicles. This upgrade gave me 24 Fulton balloons and was more than strong enough to capture the bear and carry him back to Mother Base for the reward. Conclusion: to capture the bear you need something powerful and non-lethal; a sniper rifle is guaranteed to get the job done quickly. You also need an upgraded Fulton to finish the job. With all these requirements it's unlikely anyone can complete this Side Op until they've been to Africa.